The Oculus is a compact, rugged, continuous rotation PTZ camera that has been specifically designed for harsh and challenging environments. 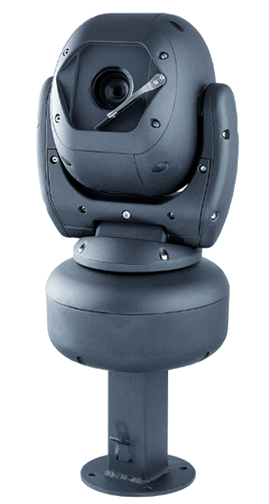 Utilizing the latest SD and HD camera modules, the Oculus can provide analogue, HD-SDI as well as IP video outputs. As with all Oculus units, everything is fully housed within a hard anodised aluminium casing, fully rated to IP67, and ready to handle the harshest of environments. The toughened, optically correct glass provides clear images and can be kept clean at all times by the compact wiper. Optical encoders for both the pan and tilt axis provide highly accurate positioning and repeatability, allied with self-correction systems that will counteract any external interference with the moving head. For low and zero light conditions IR or White LED illuminators can be built into the unit giving enhanced images to provide a greater range of detection. The Oculus can be mounted upright or inverted, and the yoke can be offset to eliminate blind spots through a full 360 degrees of rotation. Mounting accessories are available to suit standard mounting platforms, including 4” PCD.